Today is the United Nations International Day of Peace, I find it telling and sad in equal measures that this initiative has never really taken off, after all who doesn’t want peace. Well maybe a leader of a country or two, but let’s not get into that at this point. One of the things we did this year along with, the books and speeches to read, the information about Nobel Peace Prize and the United Nations Development Goals. Beside the reflections to meditate on, the brand new music written for the day to listen to, the world map studded with flags for each of the 58 current conflicts throughout the world, candles to light and prayers to pray. Plus the other things too for me there were two highlights, firstly that new piece of music, composed by The Ayoub Sisters for International Peace Day, titled Called to Prayer it is on their debut album released tomorrow, 22nd September 2017. Here is a wee video about the piece, you might need to click the sound button in the video to hear it. The second thing was the doves. 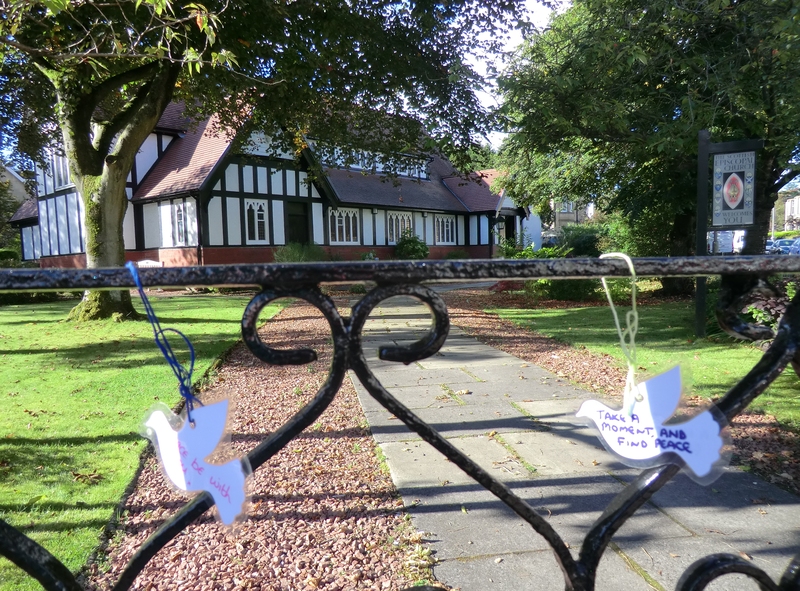 Doves are the recognised throughout the world as symbols of peace. 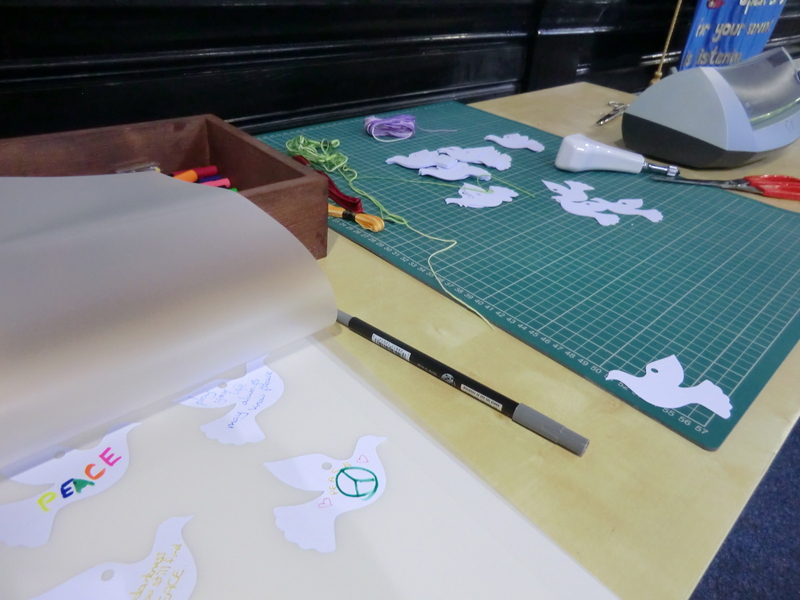 People were invited to write messages using coloured pens on paper dove shapes. The doves where then laminated before being threaded on multi coloured embroidery thread. 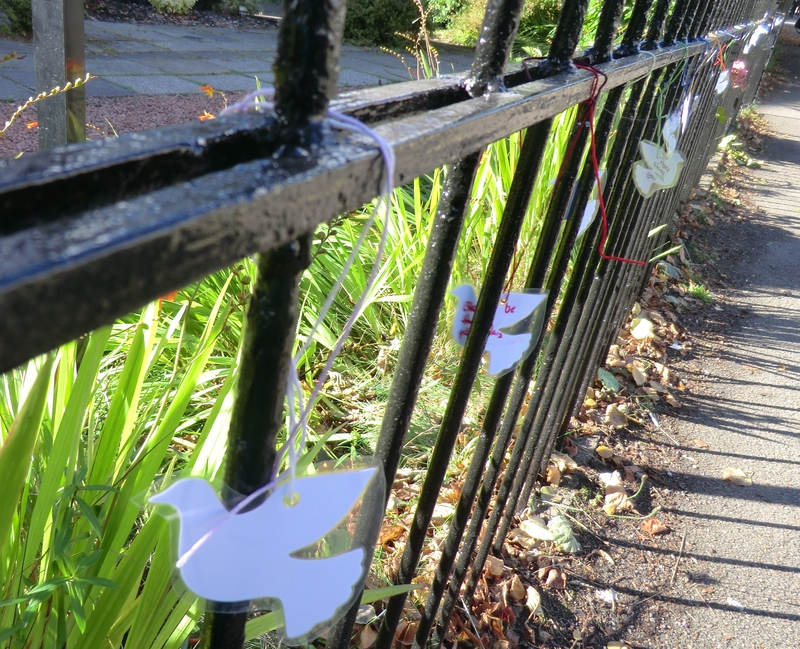 The doves whre then tied to the railings outside the church, where they fluttered in the autumnal sunshine proclaiming their message of peace to all who passed by. 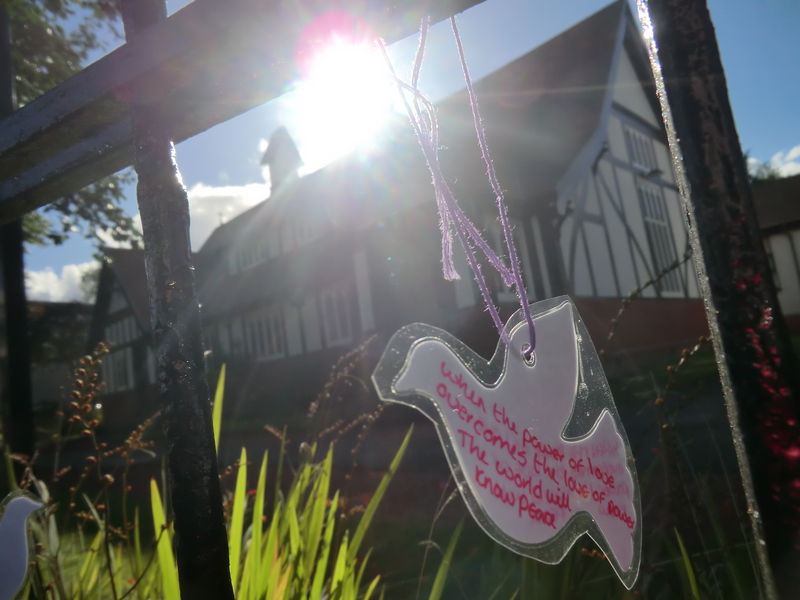 This was my favourite dove of the day, written by Kayleigh, I also think this might be my favourite picture of the day even though it leaves a lot to be desired in photographic terms. The dove says: When the power of love overcomes the love of power, the world will know peace. The doves will stay proclaiming peace for the next couple of weeks. Maybe, just maybe, they will also be added to, making peace grow one little dove at a time.